I've only just recently started watching old westerns so the expectations I had going in is that they'd be about a bunch of cowboys killing a bunch of Indians wearing feathers. I wasn't really expecting much depth or attention to social issues. I was more expecting overtly racist films just churned out for profits. While I'm sure that is out there I have to say I've been pleasantly surprised so far. In John Ford's classic Fort Apache the Native Americans aren't treated as blood-thirsty savages but as a nation trying to take care of it's people. The movie stars Henry Fonda as a military officer who has fallen out of favor with the army brass so gets transferred to the sleepy western outpost Fort Apache. His hubris and desire to be restored to a better post lead him to underestimate the Apaches and as a result the soldiers under his command and members of the Apache nation needlessly pay the price. John Wayne plays the counter to Fonda's arrogance. 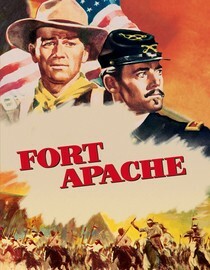 Wayne's character has been stationed at Fort Apache for a number of years and as a result respects the cunning of the Apache people and instead of wishing to attack them would much prefer a peace treaty. The more I watch his movies the more I am beginning to realize that John Ford is one of those rare directors that can handle the complexity of controversial historical and social issues and still make an entertaining movie out of it. John Wayne and Henry Fond were both very good in their respective roles and if you're looking for a good western this would be a great place to start. Why is it in your queue? I've been meaning to watch more westerns and I think it's required to start out with John Wayne and John Ford. Best thing about the movie? The way they portrayed the folly of a commanding officer who underestimates his opponents. What mood should I be in to watch this movie? For some westerny goodness.